Below you will see various photos/vidoe we captured mostly from our home. 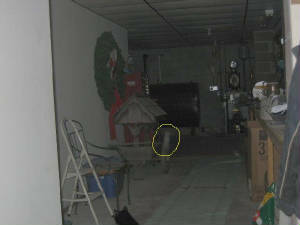 Some were during an investigation that we took and others are random. Here you will see the best of the best and perhaps a few controversial ones to other investigators out there. If it prompts a discussion amoung our fellow investigators on the web than we did our job very well. When this photo was first taken it was a random shot taken on a "feeling" of not being alone. There was no investigation going on at the time. Once it was put up on the computer we thought it to just be an orb. 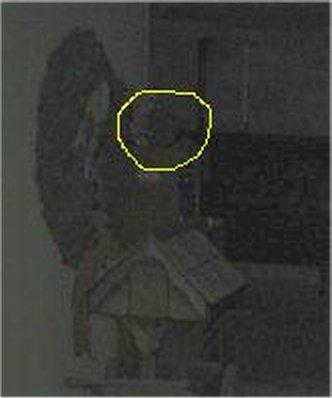 However, upon bringing the image up closer we soon discovered it was more than an orb. It's a very detailed man's face. You can see the beard, ears, mustache, eyes as well as facial outline features. This contrail is interesting. The wood is dull and does not have a shine so one can't help but wonder exactly what that is. We have no idea who that man is. My best friend thinks it looks something like her deceased husband. I'm on the fence about it. It definately confirmed to us that we were not alone. 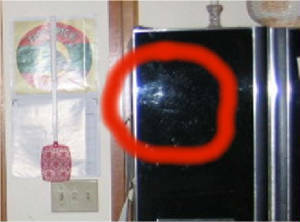 I know many investigators would highly debate this one but let me assure you there are NO fingerprints on the fridge at the time this was taken. There are no pictures to reflect a face image hanging in my kitchen. This is clearly a man with a mustache, beard, facial features, complete with glasses. 4 photos were taken and this was the only one to turn out like this. No one in the house looks like this. I was alone when this was taken. Being a woman, that rules me out. This was a random shot. If you look closer you can see slight details of a man's face. This was taken from the steps because I felt something down there. I guess it pays off to listen to those feelings. Below are a few video clips. We have no idea what they are but found it to be very interesting. This clip is of what looks like a small black dot on the edge of a box. It seems to hop off the box and make a circle around my foot landing back on top of the corner of the box. This was taken in 2006. Now this one was really a surprise to us. 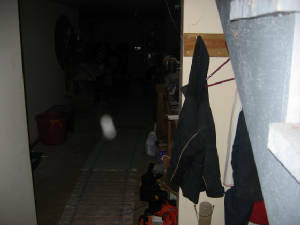 After the investigation was over you see that the light is shut out and I have passed the camera before this "thing" came around the corner and down the hall before leaving the view of the camera. There is no way it was a piece of lint or anything like that as no windows were open down there. We found it intriguing how it seemed to have rounded the corner. Here we captured a contrail. Mind you this is the only room in the basement with a window but we know it is not light from an outside source as we had the window covered with a heavy blanket for the purpose of keeping outside interference out. Here we have another contrail. Each time an investigation was done that window was covered with a heavy blanket. No one was in that room at all and no light source was around that area. The camera we used in this particular room is zero lighting (the type the military uses). Just leaves one with more questions. There are a few cases where we captured this same black thing around the same area. This isn't a mouse. Mice don't just disappear into thin air as you will see this thing do. There were breaks in the motion of it as well. Unnatural as if it had it's own path of motion defying physics as we know it. The contrails seem to love this particular part of the room. Once again the window was covered completely. No light sources or person was in the room. We have investigations coming up very soon! 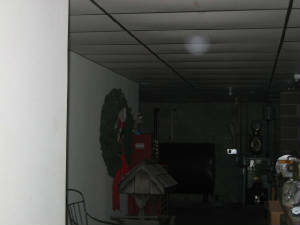 © 2006-2008 Copyrighted by K & C Paranormal Investigations. No pictures, evp, video clips or digital video may be used in whole or part on any other web sites, groups (private or otherwise) or private collections without the written permission of the owners.